Life here has been far too hectic for my liking!!! But I have a few bits of news to share...:) The first is......drumroll please..... I am pregnant and expecting Sereika baby #4 in early June! :) I am eleven weeks along now and hoping to get "over the hump" of icky sicky soon! I know my blog has suffered the most here lately...I have been sick, we had a scare three weeks ago and I am not battling what the Dr.s feel is a Kidney Infection...NOT FUN....So on that note, while we are THRILLED, I am a bit subdued in my celebrating due to having too much health stuff to deal with! LOL I am ordinarily the pregnant woman who has nothing to say but , yeah I am eating enough, no I am not throwing up much, yes I am taking my vitamins...and the Dr.s say "your weight looks good, your iron is fine, see you in four weeks!" However this time I have seen the inside of the Drs office far too much and have hear that sweet smug nurse say one too many times.. "Undress from the waist down, cover up with this, they will be right in" as she hands me what appears to be an oversized dinner napkin as she closes the door...to leave me sitting scantily clad and freezing for what seems an eternity!! LOL Ahhh the joys of motherhood...tee hee...ANYWAY...So that is the fun news!!! 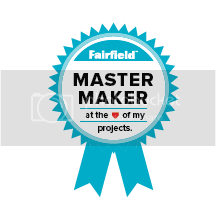 The cheating is that I am going to load a few "predone, previously published projects" on here to keep the blog up and going on a more regular basis as I feel bad about not uploading as often as I like!! :) So here is the first...this was published as an online Bonus Project over at Crafts N Things.com... enjoy!! 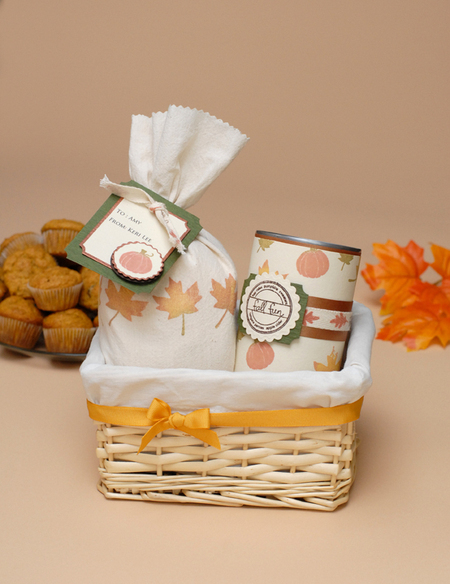 Natural colored Muslin material, 15 oz can of pumpkin, lined gift basket. Computer and printer for tag info.